We show here the in vivo insertion of an osmotic pump for constant local drug delivery and the creation of hindlimb ischemia in a mouse model. Moreover, the hindlimb vasculature is perfused with Microfil, a silicone radiopaque agent, to prepare for micro-computed tomography (micro-CT) imaging. Liu, X., Terry, T., Pan, S., Yang, Z., Willerson, J. T., Dixon, R. A., Liu, Q. Osmotic Drug Delivery to Ischemic Hindlimbs and Perfusion of Vasculature with Microfil for Micro-Computed Tomography Imaging. J. Vis. Exp. (76), e50364, doi:10.3791/50364 (2013). Preclinical research in animal models of peripheral arterial disease plays a vital role in testing the efficacy of therapeutic agents designed to stimulate microcirculation. The choice of delivery method for these agents is important because the route of administration profoundly affects the bioactivity and efficacy of these agents1,2. In this article, we demonstrate how to locally administer a substance in ischemic hindlimbs by using a catheterized osmotic pump. This pump can deliver a fixed volume of aqueous solution continuously for an allotted period of time. We also present our mouse model of unilateral hindlimb ischemia induced by ligation of the common femoral artery proximal to the origin of profunda femoris and epigastrica arteries in the left hindlimb. Lastly, we describe the in vivo cannulation and ligation of the infrarenal abdominal aorta and perfusion of the hindlimb vasculature with Microfil, a silicone radiopaque casting agent. Microfil can perfuse and fill the entire vascular bed (arterial and venous), and because we have ligated the major vascular conduit for exit, the agent can be retained in the vasculature for future ex vivo imaging with the use of small specimen micro-CT3. Peripheral arterial disease (PAD) is an atherosclerotic disease that causes insufficient blood supply in the legs4. It affects 8 to 12 million Americans, and current medical treatments offer only limited relief5,6. Novel therapeutic agents that improve blood circulation in legs would not only restrain disease progression but also enhance quality of life. The incidence of PAD is higher in people over the age of 50 years, so local pharmacologic therapy is a more desirable treatment modality because the reduced kidney and liver function often seen in older patients can decrease drug metabolism and increase side effects with systemic administration. Thus, we created a mouse model of PAD to examine whether locally administered agents alleviate hindlimb ischemia by promoting angiogenesis and microvascular remodeling. Specifically, we used a catheterized osmotic pump to continuously deliver the therapeutic agent to the ischemic thigh muscle of mice. Using our delivery system, we were able to maintain optimal concentrations of the drug in the local environment; this approach allows for appropriate drug bioactivity, avoids possible systemic side effects, and overcomes the disadvantage of limited local drug access associated with systemic administration. 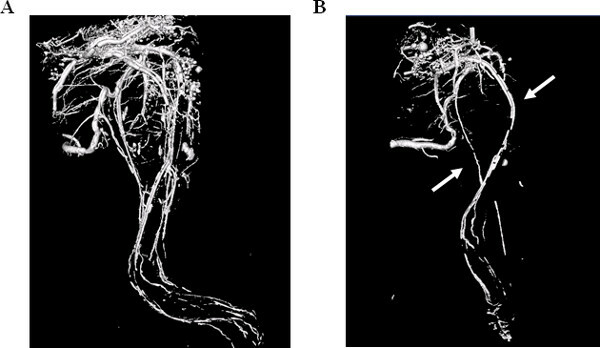 Additionally, to assess whether locally administered agents promote revascularization, we used advanced casting and high-definition imaging techniques that enable quantification of changes in the microvasculature. Collectively, the combination of methodologies used in this video article is useful in preclinical studies to aid in understanding pharmacologically induced revascularization in PAD patients7-9. Use sterile techniques (e.g. gloves, laminar flow hood) when preparing the pumps. Remove the pump and flow moderator from the packaging. Weigh the empty pump and record the weight (mg). Fill the pump slowly, to avoid creating air bubbles, by using a small 1cc syringe and blunt-tipped 27G filling tube. When the solution reaches the top of the pump, stop filling. Use a pair of forceps to break the white flange from the flow moderator; be careful not to bend or crush the tube. Attach a P50 catheter to either end of the moderator, covering about 3-4 mm. Use a syringe to fill the catheter and attached moderator and leave the syringe attached to the distal part of the catheter. Insert the flow moderator into the pump until the catheter is flush with the pump surface. Then, remove the syringe from the distal end of the catheter. Place the pump in a sterile 0.9% saline or PBS solution in a 37 °C incubator for a minimum of 6 hr (preferably O/N) to prime the pump before implanting it into the mouse. The pump delivery rate varies with the model number (i.e. Model 1002 = 0.25 μl/hr for 14 days). Anesthetize the mice with isoflurane set between 2-4% in 100% O2 at a flow rate of 0.4 L/min and remove the hair (preferably the day before surgery) on the hindlimb and back area with a depilatory cream. Sterilize all surgical tools before surgery. Place the mouse in the induction anesthesia chamber. Use the same anesthesia settings described in Section 2.1. Wait until the mouse is non-responsive to outside stimuli and then place it in the prone position onto the operating table with a fitted nose cone that delivers a continuous flow of isoflurane (1.5-2.0%). Inject the recommended dose of anesthetic (Bupivacaine; 0.25% (<1 ml/kg)) at the incision site; treat the skin with a povidone-iodine solution followed by 70% ethanol. Make a 4-6 mm incision on the back (at the side of the spinal column, in the scapulae region). Separate the subcutaneous membrane with fine forceps; then turn the mouse to the supine position treat the skin with a povidone-iodine solution followed by 70% ethanol and make 0.8-1 cm incision with micro-surgical scissors above the knee towards the medial thigh, following the path of the femoral artery. Tunnel up the side of the torso with small sheath tubing (6-French) from the medial thigh to the incision on the back. Place the mouse in the prone position. Remove the primed osmotic pump/catheter from the PBS solution and guide the catheter, through the sheath tubing, to the thigh. Position the pump inside the back and close the back incision with 6-0 prolene suture (treat the skin with a povidone-iodine solution followed by 70% ethanol). Place the mouse back in the supine position; remove the sheath tubing, leaving the catheter exposed through the incision on the thigh. Secure the leg with surgical tape. Separate the subcutaneous fat tissue to reveal the vasculature. To better visualize the vasculature, use a retractor to open the incision. Pierce the membranous femoral sheath gently by using fine-pointed forceps to access the vascular bundle. Dissect and separate the femoral artery from the femoral vein and nerve near the groin, taking care not to cause excessive bleeding. Place two 8-0 prolene adjacent sutures to interrupt the femoral artery 2-3 mm proximal to the femoral bifurcation (the origin of the profunda femoris and epigastrica arteries). Cut the catheter to the appropriate length and place the tip to the anterolateral region of the thigh, securing it with a 6-0 prolene suture to the superficial fascia to ensure targeted delivery of the substance. Close the leg incision with a 6-0 running suture. Administer a final subcutaneous injection of analgesic (Buprenorphine; 0.1 mg/kg), treat the skin with a povidone-iodine solution followed by 70% ethanol and return the mouse to the cage. Use a heating lamp during recovery. After a 30-min recovery period, prepare the mouse for laser Doppler imaging to confirm the creation of hindlimb ischemia. Monitor the animal twice daily for 5 days after surgery. Mobility of the animal will be observed to analyze pain; waste in the cage will serve as an indicator of eating. Also, during the monitor period determine if the animal is experiencing pain or discomfort and give a subcutaneous injection of Buprenorphine (0.1mg/kg) twice daily. Anesthetize the mouse as stated in Section 2.1. Transfer the mouse onto the operating table in the supine position. Inject 1,000 IU of heparin subcutaneously to prevent clotting in the vasculature. While the mouse is attached to the nosecone, make an incision large enough to expose the thoracic cavity and the lower abdomen. Move the abdominal organs to the left side of the animal to expose the infrarenal abdominal aorta (IAA). Carefully separate the aorta from the inferior cava vein. Ligate the proximal IAA to reduce bleeding during catheter insertion. Then, make a small incision on the IAA. Insert a 27½ G blunt needle (attached to a P10 catheter) into the IAA and secure it with a 6-0 suture. Fill two 20cc syringes with heparinized saline and 10% neutral buffered formalin (NBF). Fill a 5cc syringe with a contrast radiopaque silicone rubber compound. Mix the three ingredients of MV-compound: MV-diluent: MV-curing agent in working ratios of 1:1.25:0.5. Since the mixture (Microfil) only has a working time of 20 min before the agent polymerizes, it is recommended not to add the MV-curing agent until right before injection into the vasculature. Make a cut in the right atrium and administer an overdose of isoflurane to induce euthanasia and to allow for drainage of excess fluid. Attach the saline-filled syringe to the needle tip and begin to flush the vasculature for 5 min. Make sure all the blood is flushed out of the vessels; turn off the isoflurane and disconnect the nosecone once the flushing begins. Next, attach the formalin-filled syringe to the catheter detailed above (3.2) and pressure perfuse for an additional 5 min. Finally, perfuse the last syringe, with the contrast agent, slowly into the mouse for 5 min. Optional: Photograph the Microfil in the vasculature with a camera to ensure that only the arterial structure is perfused. Place the mouse in a container filled with 10% NBF and store at 4 °C O/N for contrast agent polymerization. After 24 hr, remove the skin on the lower half of the torso (distal to the lower abdominal aorta ligation) by using dissection tools, refresh the 10% NBF, and place the mouse back into the container for 4 more days at RT. Dissect the contralateral and ischemic hindlimbs, and place the specimens in a formic acid solution (Cal-Ex II) for 48 hr to facilitate decalcification of the bone. Then, rinse the specimens under running water for 1 hr and return to 10% NBF and proceed with Faxitron (x-ray system used to ensure the bone is decalcified) and micro-CT imaging. The animation demonstrates the osmotic pump insertion and hindlimb ischemia surgery detailed in the protocol. Figure 1 shows laser Doppler images of perfusion of the hindlimb, confirming ischemia. After vascular casting with Microfil, a 3D micro-CT image of the vascular network shows that Microfil can fill the vessels effectively (Figure 2A) but that discontinuities can occur (Figure 2B) due to various procedural factors (e.g., air bubbles, lack of pressure, viscosity of the Microfil). Place the mouse in the prone position and make an incision on its back at the side of the spinal column. Expose the small back incision. Place the mouse in the supine position and make a small incision above the knee at the medial thigh. Separate the skin, expose the vasculature, and insert the sheath tubing up the side torso of the mouse to the back incision. Take the osmotic pump and insert the catheter into the sheath tubing. Place the mouse in the supine position and guide the catheter down through the tubing to the incision in the thigh. Place the mouse in the prone position and position the pump on its back and close the incision. Place the mouse in the supine position and remove the sheath tubing. Pull back the skin with a retractor and use microsurgical tools to separate the vein from the artery. Double ligate the femoral artery above the femoral bifurcation with suture. Secure the catheter to the superficial tissue of the thigh. Close the leg incision with suture. Figure 1. Confirmation of hindlimb ischemia via laser Doppler perfusion imager. The representative Doppler images show the blood perfusion before and after surgical ligation of femoral artery in the mouse hindlimb. Ischemia was created in the left hindlimb (see arrows). Figure 2. 3D Micro-CT image of hindlimb vasculature. Vascular casting with Microfil reveal a network of veins and arteries throughout the hindlimb (A). Discontinuity of the Microfil can also occur (B), disabling the visualization of a detailed vascular network (see arrows). Here we present a method for osmotic drug/substance delivery in a mouse model of hindlimb ischemia. In addition, we describe a casting technique in which we have used Microfil to produce a 3D reconstruction for analysis of the vascular network. The level or severity of ischemia varies according to where the arterial ligation/excision is made. We created a double ligation in the common femoral artery proximal to the origin of the profunda femoris and epigastrica arteries; this approach can produce a more severe ischemia in the distal hindlimb. Be sure to monitor the animals after surgery and provide pain relief by local administration of analgesics. Additionally, the Microfil may not always perfuse limb vasculature completely. Thus, it is important to ensure that all blood is rinsed out of the vasculature after the perfusion of the heparinized saline. Reasons for incomplete perfusion of the Microfil include the lack of applied pressure or improper viscosity of the Microfil, both of which must be adequate to ensure the Microfil reaches the most distal regions of the hindlimb and thus fills the entire vasculature. To address these issues, apply consistent pressure at 100 mmHg and experiment with the compound:diluent ratios for the particular animal application. To study arteriogenesis (pre-existing collateral artery growth), the ideal approach is to ligate the femoral artery immediately distal to the origin of the deep femoral branch to redirect blood flow to the collateral vessels. However, the response to this procedure varies widely among mouse strains, and the extent of ischemia may be insufficient in some mouse strains (e.g., C57BL/6). A less severe ischemic model may not provide a prolonged window of time to investigate therapeutic effects in heavily vascularized mouse strains such as C57BL/6. To avoid these issues, we created hindlimb ischemia by ligating the proximal femoral artery, which created a more severe ischemia to better demonstrate the local drug release effects; however, this approach precludes analysis of arteriogenesis in the proximal deep branch collateral vessels. Thus, the therapeutic effects are drawn mainly from the distal ischemic region, which is consistent with the anatomic location (anterolateral thigh) where the drug/substance is released. During surgery, it is critical not to injure the fragile femoral vein because local bleeding can lead to inflammation and edema, which affect both arteriogenesis and angiogenesis. We recommend using 8-0 prolene sutures to ligate the femoral artery with an appropriate knot tie to avoid stretch, strain, or rupture of the artery. In addition, Microfil must be used immediately (within 20 min) after mixing the 3 ingredients (compound, diluent, and curing agent) because it quickly polymerizes, which creates technical difficulties for injection. As previously stated, Microfil does not always successfully perfuse the smaller vasculature, but practice and use of proper techniques can help overcome this limitation. The pump fill volume must be over 90% of the mean fill volume; if not, extra air may get trapped inside the pump. Additional technical information is located at www.alzet.com. In addition, the Microfil agent must be at the preferred viscosity for a particular application, so the ratio of diluent to compound may need to be modified. The hindlimb ischemia model is highly reproducible and is applicable to PAD10,11. The stable delivery of therapeutic agents in this model is necessary to obtain informative results2. In conclusion, the 3D imaging technique we used to visualize the morphologic structures is an excellent tool for examining the mouse vasculature and provides a powerful system for studying vascular pathologies. The authors declare no conflict of interest. All animal procedures were conducted in accordance with the Guidelines for the Care and Use of Laboratory Animals and were approved by the Institutional Animal Care and Use Committee (IACUC) at the University of Texas Health Science Center at Houston. The authors would like to thank Keith Michel of the MD Anderson Small Animal Imaging Facility for his technical assistance with micro-CT imaging, Edward T.H. Yeh, MD, for surgical assistance, and Rebecca Bartow, PhD, for editorial assistance. This work was supported in part by the American Heart Association. Epstein, S. E., Fuchs, S., Zhou, Y. F., Baffour, R., Kornowski, R. Therapeutic interventions for enhancing collateral development by administration of growth factors: basic principles, early results and potential hazards. Cardiovasc. Res. 49, 532-542 (2001). Esaki, J., Marui, A., Tabata, Y., Komeda, M. Controlled release systems of angiogenic growth factors for cardiovascular diseases. Expert Opin. Drug Deliv. 4, 635-649 (2007). Bentley, M. D., Ortiz, M. C., Ritman, E. L., Romero, J. C. The use of microcomputed tomography to study microvasculature in small rodents. Am. J. Physiol. Regul. Integr. Comp. Physiol. 282, 1267-1279 (2002). Golomb, B. A., Dang, T. T., Criqui, M. H. Peripheral arterial disease: morbidity and mortality implications. Circulation. 114, 688-699 (2006). Hiatt, W. R. Pharmacologic therapy for peripheral arterial disease and claudication. J. Vasc. Surg. 36, 1283-1291 (2002). Hirsch, A. T., et al. Peripheral arterial disease detection, awareness, and treatment in primary care. JAMA. 286, 1317-1324 (2001). McDonald, D. M., Choyke, P. L. Imaging of angiogenesis: from microscope to clinic. Nat. Med. 9, 713-725 (2003). Hirsch, A. T., et al. ACC/AHA Guidelines for the Management of Patients with Peripheral Arterial Disease (lower extremity, renal, mesenteric, and abdominal aortic): a collaborative report from the American Associations for Vascular Surgery/Society for Vascular Surgery, Society for Cardiovascular Angiography and Interventions, Society for Vascular Medicine and Biology, Society of Interventional Radiology, and the ACC/AHA Task Force on Practice Guidelines (writing committee to develop guidelines for the management of patients with peripheral arterial disease)--summary of recommendations. J. Vasc. Interv. Radiol. 17, 1383-1397 (2006). Zagorchev, L., Mulligan-Kehoe, M. J. Molecular imaging of vessels in mouse models of disease. Eur. J. Radiol. 70, 305-311 (2009). Losordo, D. W., Dimmeler, S. Therapeutic angiogenesis and vasculogenesis for ischemic disease. Part I: angiogenic cytokines. Circulation. 109, 2487-2491 (2004). Waters, R. E., Terjung, R. L., Peters, K. G., Annex, B. H. Preclinical models of human peripheral arterial occlusive disease: implications for investigation of therapeutic agents. J. Appl. Physiol. 97, 773-780 (2004).